100th Day of School Tees Just $14! Down From $28! FREE Shipping! You are here: Home / Great Deals / 100th Day of School Tees Just $14! Down From $28! FREE Shipping! 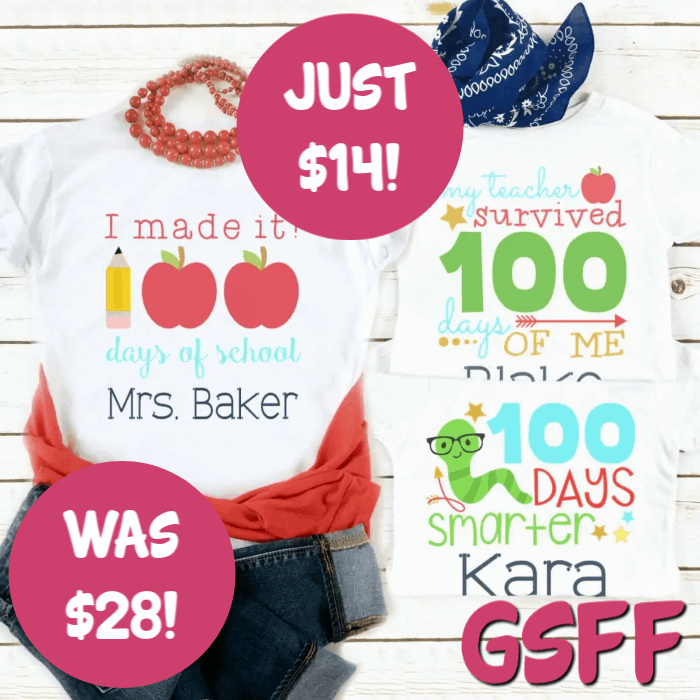 Right now you can score these 100th Day of School Tees for just $13.99 down from $28 PLUS FREE shipping! Be ready to celebrate 100 days of school with one of our New Custom T-shirts in youth & adult sizes! Choose from 9 great designs and customize your shirt with a personalized name up to 16 characters. With 9 different designs to choose from. The direct to fabric printing results in a soft, smooth design. Customize your design with a personalized name up to 16 characters.